Take Exit 24 (Valley Forge). Continue on the Philadelphia Expressway (Interstate 76E) for approximately 18 miles, then follow signs toward Philadelphia International Airport for 3 miles. 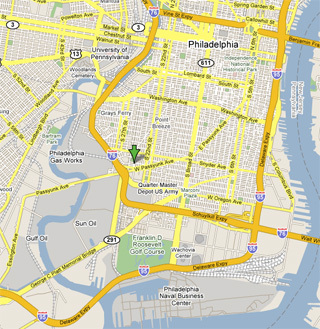 Watch for and exit at Passyunk Avenue (Center Lane). Take left at traffic light onto Passyunk Avenue. Go 2 blocks to 24th Street. Turn left onto 24th Street. Pass 2 stop signs. Church will be on left. There is no off-street parking at the Church complex. Take Exit 4. After toll, take ramp on right (Route 73 North) for 1/8 mile. Then take Interstate 295 South toward Philadelphia and the Walt Whitman Bridge. Cross Walt Whitman Bridge and continue straight on Interstate 76 West (remaining in right lane) to Passyunk Avenue exit. Take left at traffic light onto Passyunk Avenue. Go 2 blocks to 24th Street. Turn left onto 24th Street. Pass 2 stop signs. Church will be on left. There is no off-street parking at the Church complex. Take Interstate 95 South to Broad Street exit (Sports Complex). Follow Broad Street (approximately 4 traffic lights) to Oregon Avenue. Turn left onto Oregon Avenue. Follow to 24th Street (Burger King - McDonald's). Turn right onto 24th Street and follow for several blocks until Church appears on your left. There is no off-street parking at the Church complex. Take Interstate 95 North to Broad Street exit (Sports Complex). Follow Broad Street (approximately 4 traffic lights) to Oregon Avenue. Turn left onto Oregon Avenue. Follow to 24th Street (Burger King - McDonald's). Turn right onto 24th Street and follow for several blocks until Church appears on your left. There is no off-street parking at the Church complex.